When life gives you mangos, what do you make? The mango season is nearly at its end. In the eyes of Constance Spry the Alphonso mango is superior. For what its worth, they are in mine too. Alphonso mangos are essentially a hybrid or, if you will grafted mango. They are notoriously difficult to grow. They demand respect. 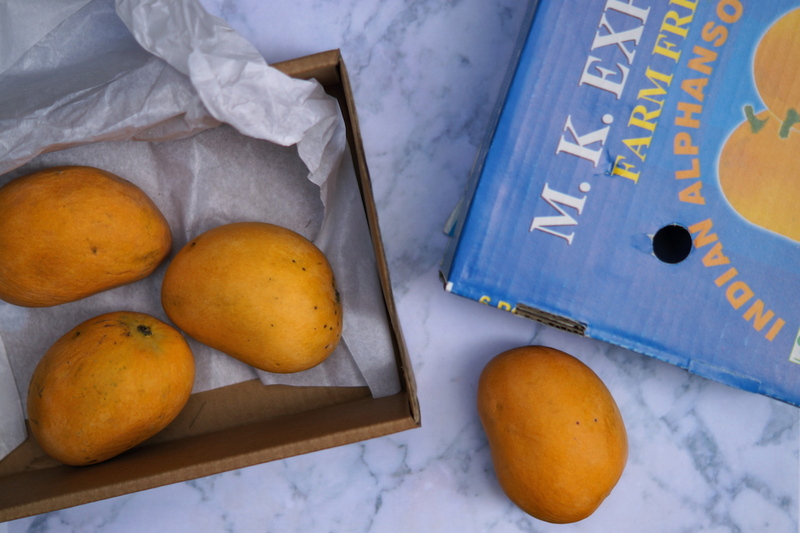 If we consider the above, to be presented with a box of Indian Alphonso Mangos as a gift is quite a big deal, and the question of what to make with them a crucial one. So I turn once again to my favourite summer indulgence, ice cream. I check the flavour thesaurus for inspiration then go my own way. This is swift, healthy, refined sugar free recipe so it would be quite acceptable to eat these for breakfast, should you so wish but ultimately these are delicious all day long. 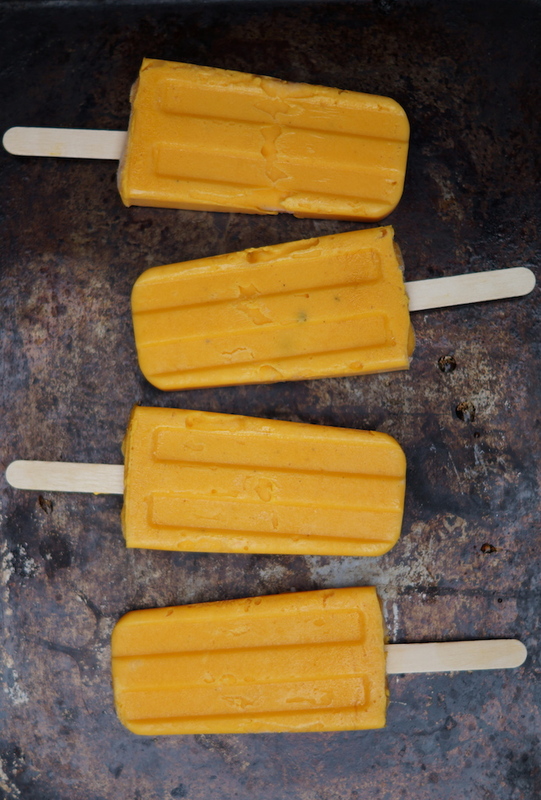 Cardamom is optional, but its floral earthiness helps cut through the sweetness of the mangos. Full fat yoghurt is essential as the fat helps prevent the formation of ice crystals in the finished ice pop. This recipe makes 5 ice pops. Remove the skin and the stone from the mango and discard. Using a blender or stick blender mix the mango pulp, yoghurt and cardamom together until smooth, this should take just a few seconds. Taste the mix and if needed add a little honey then blend for a further few seconds. 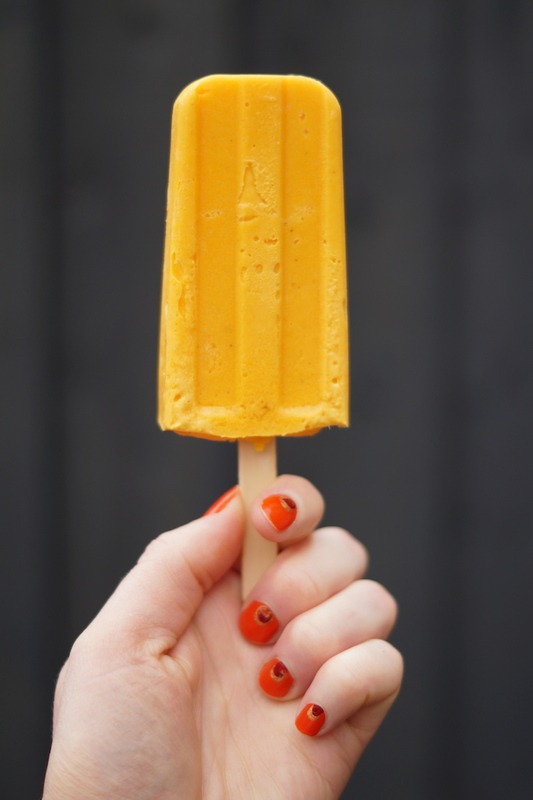 Spoon or pipe the mix into ice pop moulds and freeze for a minimum of 4 hours. To serve, remove the pops from the freezer and run the mould under hot water for around 10 seconds for easy release from the mould. This recipe works without an ice pop mould too, if you fancy just fro-yo then pop the mix into an ice cream churner after blending, then churn and freeze according to manufacturers instructions. If you do not have an ice cream maker place the blended mixture into a tupperware container and freeze for half an hour or so until semi frozen, give the mixture a good stir and freeze for a further half hour then stir again. This will prevent ice crystals from forming. Repeat this step until the sorbet is firm. What do you make with your mangos? Oh my gosh, these sound amazing. I wonder if they’d work with soya yoghurt to veganise them? Hey Janet, that’s an amazing question and one I really don’t know the answer to! Its all down to fat content, which full fat yoghurt has in spades but i’m not sure if soya does. I’ve consulted my technical advisor (C) and he suggests soya cream, rather than yoghurt and dextrose instead of honey which would make the mix stay softer, rather tun freezing hard. So, we shall investigate further……….